When I renewed my Create and Craft membership I wanted to use my £10 credit on something I had had my eye on for a while but not felt able to justify – Craftwork Cards’ Noir de Luxe collection. I got my parcel and sat very happily looking through it, thinking of all the fabulous Christmas cards I’d be able to make. Then I decided I wanted to make the most of the collection and I looked back through it with different cards in mind. My Tattered Lace Bunny die has been sitting in my stash, sadly underused. I have to admit I’m very broody at the minute – looks like we’re going down the IVF route and I can’t get babies off the brain. The bunny, broodiness and ‘believe in magic’ sentiment all mushed together into a quirky baby card as shown above. 1) Mat a piece of 121x173mm grey with white squiggles paper from Noir de Luxe onto a piece of black card stock 123x175mm. 2) Wrap a piece of ribbon around right hand side of page, attaching on the back to keep it neat. You want about 3mm of the grey showing to the right. 3) Die cut bunny from gold mirri card. Attach to a 89x60mm piece of dark grey cardstock. 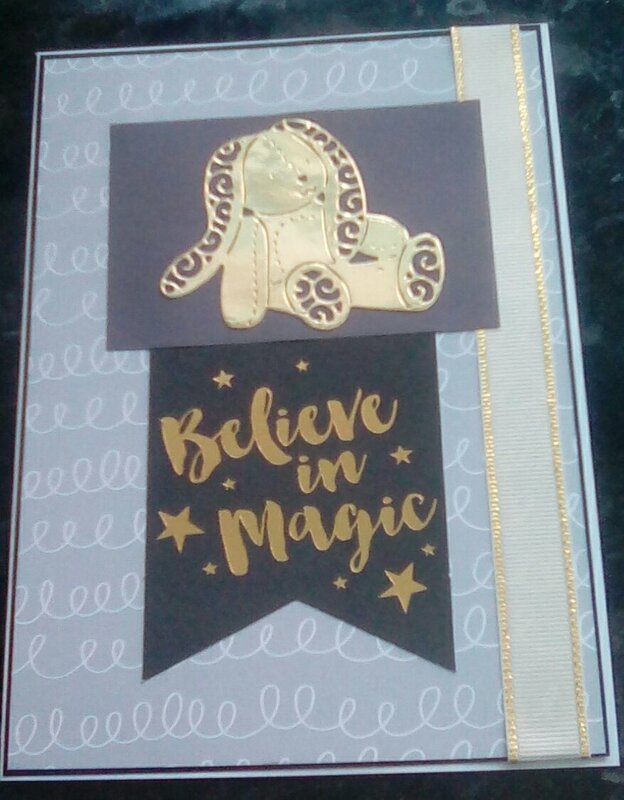 4) Attach the Believe in Magic tag to the middle of the card. 5) Stick the rabbit topper from step 3 17mm in from top and both sides. This should cover the top of the tag and overlap the ribbon. 6) Now stick your work to the card blank et voila. This entry was posted in Uncategorized and tagged card making; tattered lace; Noir de Luxe; Craftwork Cards on July 22, 2016 by Isn't She Crafty.